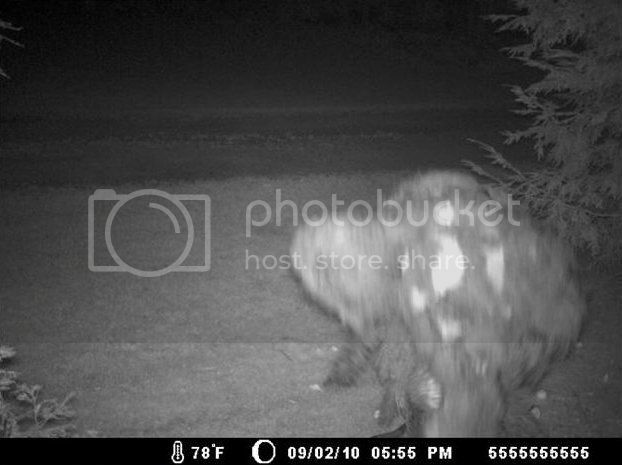 The Vermont Trail Camera photo was obtained on September 3, 2010 by a man named Frank (last name withheld). Frank and his wife live on a rural property in western Vermont. They own several acres backed up against large expanses of privately owned forest. On their property, there are eighteen fruit trees specifically planted and maintained to bring in wildlife for Frank’s and his wife’s viewing pleasure. In their front yard is a decent sized pond which contains numerous trout, and just down the road from the property is another even larger pond several acres in size. The surrounding hills are steep and thickly wooded making the area excellent habitat for all sorts of creatures. On top of it all, the area has a history of bigfoot activity as well. Several years before the photograph was obtained, one of Frank’s neighbors reported seeing a sasquatch down the road from Frank’s property. Frank’s wife remembers hearing strange noises in the woods the week that this photograph was obtained. Those noises included banging and strange vocalizations. After obtaining the photo, Frank asked the Vermont Fish and Wildlife Department what is in the photograph. They didn’t know, but suggested it was an owl. Thinking this was a ludicrous explanation, Frank later went to Steve Kulls, a New York-based bigfoot researcher who did his own investigation into the photograph. Steve’s excellent analysis of the photo, as well as other background information on the picture, can be found here. I spent several hours with Frank and his wife talking about the photographs and the surrounding area. I am utterly satisfied that Frank is not lying about the photographs or the circumstances surrounding them in any way. Click this link to read the rest of the article. That's a bird, most likely an owl, flying in front of the camera. It appears so large (and blurry) because it is very close to the camera. If it's a bird and it's near the camera, where is the shadow it should be casting in the rest of the pic? There should be a very LARGE DARK shadow being cast if it is something near the camera. Bird or Bigfoot, it's definitely NOT something near the camera, there's no shadow. I noticed the way the subject is leaning and to me, it looks as though it can see the IR trap on the motion detecting camera. The question I hear alot is, "why so few trail cam pic of them?". With the reports of "glowing red eyes" and the lack of photos, I would like to put forth the theory That Sasquatch can see the IR beams coming from the cams. If this is the case, when you are running your "self-cams", The Sasquatch can see you. When you call them in they come to investigate and upon seeing the group's lights they leave the area. One of you should try going completely dark, No self-cam and no cameraman, I bet you run into one. 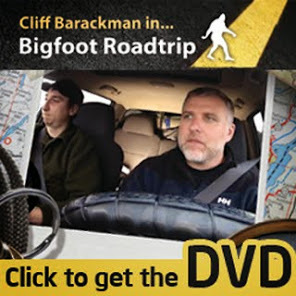 That is why Squatchers need to follow Cliff's blog for the real detective work. "Finding Bigfoot" is a reality show, and we all know what that means. If the picture was taken in September. It should not be that dark at 6 at night. Did you ever ask frank about that? That is way cool! I agree with the possibility of a little fuzzy hand, however, I also noted a little fuzzy foot behind the left arm about half way down the body. Very cool picture. I find the white patches on the back the most interesting. I would like to hypothesize oily fir reflecting the infrared light. Just a guess that oily fir with reflective properties are part of a squatches' camouflage. Also I found a picture of an owl (link below) that had similarities to the photo but, I don't think it is an owl. Best evidence I have seen on "Finding Bigfoot" yet. I tend to be skeptical about trap cams because you usually get just one picture and the person who took it puts it onto the internet and then doesn't claim it. I was pleased to see they were willing to talk about the incident. They have an ideal location and an ideal attraction and an ideal time of year for the BF to be looking for some yummies. I think it's extremely compelling. Good find! While I was watching the Vermont show on demand on a huge tv, at 14 minutes in, the flirt is shown looking into the woods in gray scale. Either that's a big hairy stump, or something large is sitting there. Please look at the footage again. A Planet Without Apes? Count Me Out!